Blurb: Emma Wiggins is about to marry her heart-stopping, gorgeous boss, CEO Evan Fletcher, in seven days—too bad he doesn’t know it yet! Desperate to fulfill her ailing grandfather’s last wish to see her settle down and get married, Emma Wiggins, a 30-year-old, career-focused executive tells him a little white lie on his deathbed that she is in fact engaged--to her boss, deliciously handsome and emotionally unavailable, Evan Fletcher. About the author: Bestselling author Shadonna Richards enjoys reading and writing about the magic of romance and the power of love. She has a B.A. Degree in Psychology and a Diploma in Nursing. She is the author of the non-fiction books, A Gift of Hope and Think and Be Happy: 365 Empowering Thoughts to Lift Your Spirit (an Amazon Kindle #1 Bestseller in Meditation). Winner of Harlequin’s So You Think You Can Write 2010 Day Two Challenge, she is also a member of Romance Writers of America. 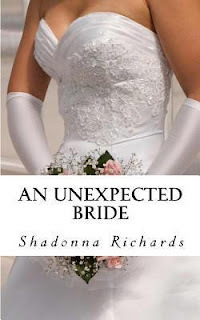 An Unexpected Bride, a contemporary romance, is her first novel and an Amazon Bestseller in Romance. It has sold 30,000 copies in its first six months on Amazon Kindle. She's a proud mommy and wife and lives in Canada with her husband and son. Thanks so much for spotlighting An Unexpected Bride on your fabulous blog!